“Sorry,” she said as she passed me in the entrance to the women’s room, “That’s my husband in the other stall. Don’t mind him.” She was going back to her car. There were only two cars parked by this restroom, mine and the older woman’s, a sturdy car like a Bonneville, gray like the sky. She was rounding the driver’s side to return to the restroom (as I returned to my car). So opens a very moving essay written by Kate Gray and published in The Rumpus. It focuses on a difficult subject: caring for a disabled spouse. I was asked to illustrate the essay. “Wheelchair” made me think of the familiar International Symbol of Access, perhaps more commonly known as the Wheelchair Symbol. 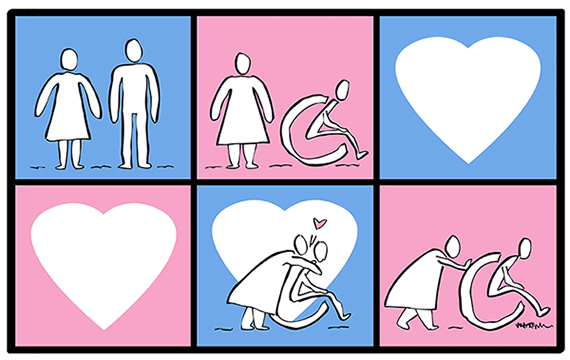 I decided to use the symbols commonly seen on restroom doors to show a progression suggested by the essay’s opening lines: a couple begins married life in good health; one of them becomes disabled; the other loves in sickness as she did in health, and demonstrates that love by caring for the disabled spouse. I drew and inked the figures by hand to give them more personality, and because it was necessary to show specific actions in the last two panels. There’s no escaping life’s barbs, but love has a transforming power, especially when it seeks the good of another. A wounded heart can love more deeply. Caregiving represents love in perhaps its purest form. Changing a spouse’s diaper is not a romantic image. Doing it in a way that preserves the person’s dignity is nothing less than heroic. Diapers made me think of bedpans, which led to this final image, a kind of meditation on love. Modern culture would have us believe that romantic love is all there is: pretty people, fun and games. Real love is much more: it embraces sacrifice and puts the other first. And it endures even after death. I enjoyed this assignment. I love a challenge, and it gave me a chance to stretch. It also got me thinking about the subtle nature of humor. The subtitle of this blog is: Because nothing succeeds like humor and good illustration. In my LinkedIn profile, I say: Nothing communicates an idea more powerfully than a carefully crafted illustration. Humor multiplies its power. Which leads to a question: where’s the humor in the above illustrations? For me, there is humor in all three illustrations, but it’s a far cry from slapstick or comical humor. It’s a quirky kind of humor that springs from the unorthodox– using objects in an unconventional way. 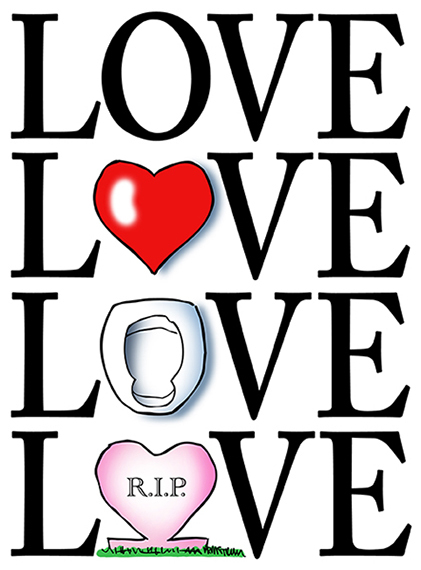 Restroom symbols acting out a mini-drama; barbed wire as a musical scale; a bedpan used to spell out the word Love. They do seem a little comical if you think about them in isolation. But woven into the graphic, they give the images a certain poignancy. Humor is a lot broader and more subtle than we normally think. It can add real power to an illustration. Do you know any caregivers? Are you perhaps a caregiver yourself? Any thoughts on love? Have we forgotten that love often demands sacrifice? Has this post broadened your concept of humor? Does humor have a unique power to communicate? The barbed wire was much more sad to me than humorous. Thank you, my dear fellow, always delighted to see you here. There’s no denying the pain in the illustration, nor in the situation it portrays. The presence of humor is debatable. Humor is nothing, if not subjective. If it is present, I’d like to think it’s unobtrusive, serving only to help convey emotion. I sincerely appreciate your visit and your feedback– thank you! Ah, Mark… humor [as i perceive it] requires a kind and pure heart. Can’t do it otherwise and cannot create images such as yours without the above ingredients. I am a caregiver, but, um, I am being cared for as well. I’ll, uh, have to show this to my wife. Mutual caregiving is a sure sign of love, hope, and faith. Sending you both my best wishes, Jak! It was hard for both of us not to read this post without some tears, but… I am glad, because, you are telling it like it is, including folks like us. A colleague lost her husband a year ago after a long illness. Your thoughtful illustrations and this story made me think of her. I always considered her strong … and brave. I especially love the symbols in the first panel. Excellent, Mark. Illustrations with heart. Thank you so much, Judy. Your thoughtful comments and kind words always give me a great boost. I can’t thank you enough. My parents celebrated their 67 years of marriage this year. Dad is 90 Mom is 86. They love one another and Mom does much of the caregiving to Dad because of his ailments but Dad loves her back in his own way. Lots of self sacrifice on both people. I was able to visit with them for 3 weeks this past spring, I live far from them. I saw day in day out the love, self sacrifice, caring, enduring and the humor these two individuals, my parents had for each other. It was a lifetime of dedication of their marriage relationship that they both worked on but but displayed genuinely only by their love for their Creator God. Thank you for your post, it was very uplifting. As you said there is humor. Laughter is the best medicine. 67 years… wow. A lifetime of caring for each other. Truly inspiring– there’s nothing more powerful than teaching by example. Whaddaya mean that’s all?? You done said a mouthful!! I would call it “heartfelt humor”. And I love it! The wheelchair symbols are my favorite. We have wheelchair and “universal” access trails at our park. I love the idea that everyone has the right to enjoy a place. Caregivers make this possible. I don’t envy their task, but thank goodness they are there for each other. I also like New York’s new wheelchair symbol. I’ve worked with folks in wheelchairs and no matter their age or disability, they deserve the more dynamic symbol. Thank you very much for your kind comment, Amelie. I agree: everyone deserves access, everyone needs to be included. I found your post very poignant Mark. A dear friend of mine has Motor Neuron disease and cannot move himself at all anymore except to raise his thumb. Watching his wife help him and the two of them struggle with this awful, awful disease, is very much the heart on the barb wire, except for them, it is three hearts as they have a twelve year old daughter who has never known her father as he was, has never been able to hear him speak to her. You mentioned humour. I can still remember a few years back trying to help Lee get Pete into the car when he could still stand briefly. We got him in but then, being so rigid, he fell across the seats rather than being in the seat. We thought he was crying and in pain when we suddenly realised he was laughing. Laughing with him, I just wanted to cry at his braveness. Whoa. Just reading your comment was an emotional roller coaster, Jen: pain, laughter, love, heartache, caring– all of the complexities of life, all the things that really matter. Needless to say, Pete’s example is what keeps the rest of us going. Stories like his (and that of his wonderfully loyal wife and daughter) need to be told as an antidote to all blather and empty posturing that seems to surround us on all sides. No one wants pain and suffering, of course, but I’ve often thought that without them, we’d never appreciate the truly important things in life. Deeply touching Mark. You are in tune with your own loving heart which was likely caught in that blasted barbed wire a time or two. It demonstrates the secret story of many artists. It is my contention that upon reaching a certain age ones heart is either broken and kind or broken and bitter, both baring the scars of life but choosing different paths of survival. All kidding aside, many thanks. Love your theory about hearts. It rings absolutely true, psychologically. That’s gotta be one of life’s toughest lessons: freely acknowledging that hurts will come, and opting to let them make you kinder and more compassionate, rather than bitter and resentful. And boy, is that easier said than done!! Thanks again for your kindness and insight. This post has broadened our concept of you. Congratulations on the sensitivity and courage in this post. Sincere thanks for your very lovely comment– it meant a lot. This is my reality. I suffer neuropathy and other chronic pain due to back problems. I cried and cried when I read this, and when I showed it to Cimmy, she did the same. She is taking the brunt of things right now, trying to help me, but then also trying to keep up with our son and his special needs. Then there is our parents and their illnesses– this issue just digs deep across generations. I am grateful to my good friend here for summing things up so well– a wounded heart DOES love more deeply. I’m deeply touched by your words, Jak– thank you. I know everyone has certain fears, worries, demons, challenges– and some have more than their share. I pray regularly for all my blogging friends. You may be sure you and your family are on my list. Courage, my friend. Oh, my dear Mark, so many experience this sometimes heartbreaking condition in their lives; being ‘taken care of’ or ‘taking care’ of a dear one. Recently both my partner and I have been on the receiving end of the other’s love and care. What a wonderful realisation to find my love’s care for me goes so deep; in a strange way it has built our relationship to an even greater bond. Such a treasure to know we are loved; in sickness and in health. I liked the last one especially…a wry, gentle look at love, long lasting love. And your couple panel. At this time not a caregiver yet…but my partner is 16 yrs. older than I. I’m 54. So believe me, Mark when we go on vacation, cycling..it is now. Not waiting until I retire. Yes, he is slowing down a bit in his cycling style. And we’re talking about who cycled across British Columbia and Alberta last year and this year. Many thanks for your kind comment, Jean, sincerely appreciated. You’re very wise to do things while you can. I’ve lost track of the stories I’ve heard about people who postponed trips or other activities until they retired, or were financially secure, only to be confronted with illness or other problems. It’s a common human failing, and a very painful one to see. Profound? Poignant? None of those could match this masterpiece you just did. Kudos to you, Mr. Armstrong! More power! You well deserve all of it, and more accolade, Mark! Your works are masterpieces; your talent is remarkable; your heart Is pure and kind–thank you for sharing and enriching the World Wide Web. Seriously, though, your kind words have energized me, and I shall be moving thru the day with a big smile on my face, and a resolve to do my best possible work. Thank again for that lovely comment, Aina, and for being the wonderful person you are.